1. 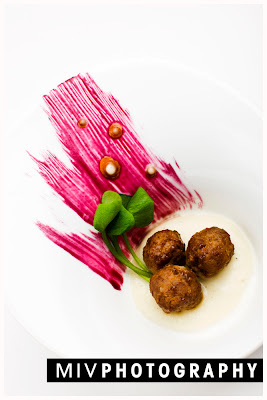 Atelier Restaurant - if you have an adventurous palate and a deep pocket for eating out, you should eat there. Eat there now. It's a fantastic new restaurant, chockful of molecular gastronomy. They serve a 12 course blind tasting menu (blind meaning that you don't get to pick what you eat, nor do you know what it is until it's served....not that the room is dark or that you are blindfolded) of fun and creative food. LOVE IT. You will also love it. Also, get the wine pairing. The sommelier is young and cute and knows his stuff. Cost for two with tip (and wine pairing) is about $330. But totally worth it for that special occasion. No doubt this will become a mecca for Ottawa foodies. 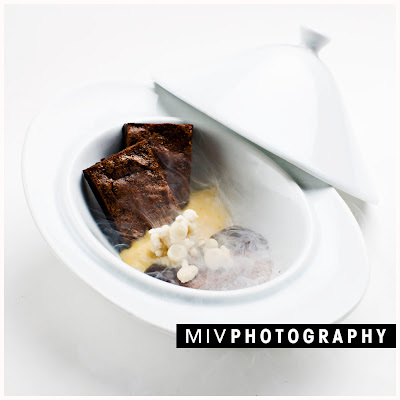 The image below is borrowed (without permission) from Miv Photography (they are awesome) - I kinda felt like too much of a touristica-tool to whip out my massive camera with its huge flash to take my own photos. The food is freaking cool. 2. 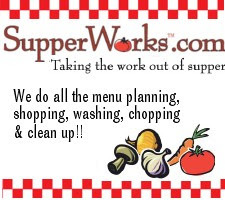 Supperworks - another cool company. They aren't entirely local, as there are franchises across the province, and other, similar companies, across the continent, but they've got a great thing. Basically, every month, they have a snazzy fresh menu. You fill in a form online and tell them which delicious things you would like to eat. Then, you arrive at your booked appointment, are offered an apron and a drink, and then you get to work in assembling your pre-ordered meals. Everything is chopped and ready for you. All you do is scoop up according to instructions, stick on a label, and throw the whole thing in your freezer when you get home. Then, when you're having a crazy week, you just defrost it in your fridge (while you're at work or running around or what have you) and come home and just quickly cook it. Most of them cook in less time than takeout, and the cost is definitely less. The added bonus is that you know exactly what went into your meal and you can actually feel good about serving it. I'm not sure how they'll fare in the floundering economy, but if it's between supperworks and take-out, supperworks is definitely the more economical option. Definitely suggest that you busy folks check it out.